Mosaics by Catherine Stott, artist and mosaicist working in Devon, UK. The earth provides minerals in abundance with great variety of colour texture and pattern, which can be used as stone or processed into coloured glass and ceramic. Catherine’s work draws on these rich resources to produce mosaics which reflect the beauty of the materials around us and the world we live in. Catherine works in both traditional and contemporary styles using a wide variety of recycled and found objects and exploring their properties. Her experience of colour and tonal work in painting is important in combining these varied materials to make a cohesive image. She creates unique works of art for interior wall display or for siting outdoors, as well as commissioned items for special occasions. For more information about mosaics, the inspiration behind the artwork and the materials used, go to the What is mosaic? page. 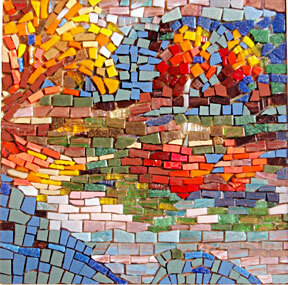 Explore the wide range of work - tile mosaics, mixed media mosaics, mosaics & collage.